Can you confirm these amateur observations of Arrhyton taeniatum? Diagnosis Diagnosis (genus): The single genus in this subtribe has 17 midbody scale rows, 107–189 ventrals, 52–140 subcaudals, one apical scale pits, 6–7 upper labials, 7–9 lower labials, 15-20 total maxillary teeth, and 20-28 dentary teeth (Table 2). It can be distinguished from the other two subtribes in the Tribe Alsophiini by its low number of dentary teeth (10–17 versus 17–35 in Alsophiina and Uromacerina) and a derived hemipenial character: the medial papillate crest extends from the lobular crotch to the edge of the capitulum on each lobe, and forms a Y-shaped structure on the distal region of the body (Zaher 1999). HEDGES et al. (2009) defined a subtribe Arrhytonina that is identical to the genus Arrhyton. Comment For illustrations see Barbour and Ramsden, 1919; Grant, Smith, and Dalmau, 1959; Schwartz, 1965; Schwartz and Garrido, 1981. A. taeniatum is the only species in Cuba that lacks a loreal. Type species: Arrhyton taeniatum is the type species of the genus Arrhyton GÜNTHER 1858. Schwartz, A. and O. H. Garrido. 1981. 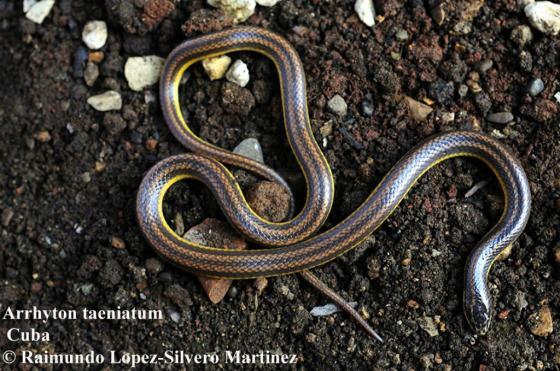 A review of the Cuban members of the genus Arrhyton (Reptilia, Serpentes, Colubridae). Annals of the Carnegie Museum 50: 207-230.